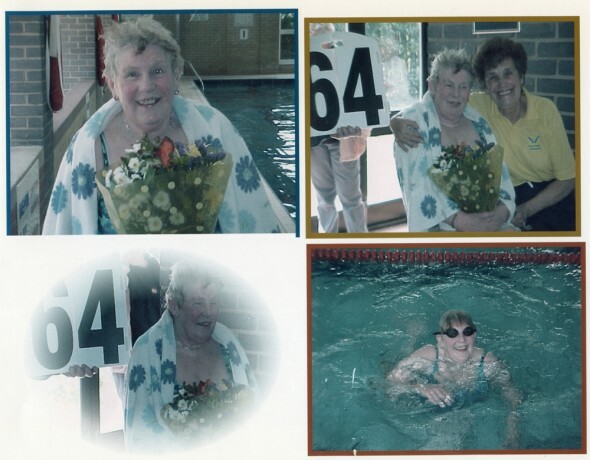 I started swimming when I retired (in the 90’s). Originally my friend Sue and I went to the dancing which Rose organised. Rose asked us if we would like to come to excersisie classes which would be in the pool. Both Sue and I were not swimmers and raised our hands in horror, so Rose pointed out there were swimming lessons (starting the next week) and run by – yes – Shirley. Both Sue and I knew Shirley from long a go (Yes Shirley it is long a go) so we decided to give it a try. 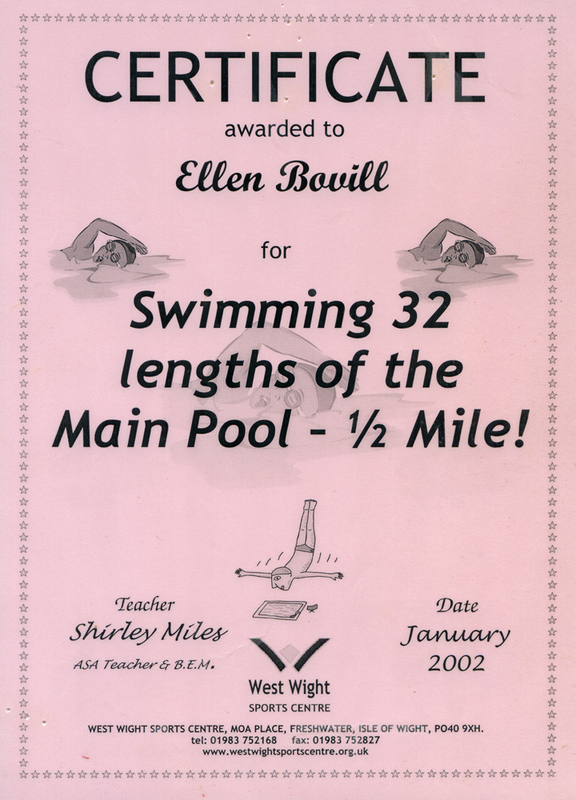 Of course we thought that the lessons would be in the little pool and shrieks of horror – it was in the big one but Shirley insisted, and so it started …… and progressed and we were both soon happily swimming round the pool, quite happy at the deep end. I also took up diving. Now surprise – surprise – I was rather good at diving, and I can remember when I started the lessons with Dawn (bless her heart) there were 2 other younger women and a young man of about 20. He saw me and looked really disgusted at this OAP.. LEARNER! But I have to say, I did one big belly flop and said ‘never again’ and listened very carefully to what Dawn said, so the next try was not a belly flop and earned me a ‘very good’ from dawn. I continued to improve and watched (with great pleasure) the YOUNG man continue to belly flop. It just shows you can’t judge a book by it’s cover. Unfortunately the diving had to stop as the arthritis spread. But NOT the swimming. This piece of furniture, hopefully will go on swimming for quite a while. Who knows, I might request a burial at sea!! This entry was posted on Monday, March 25th, 2013 at 1:45 pm. 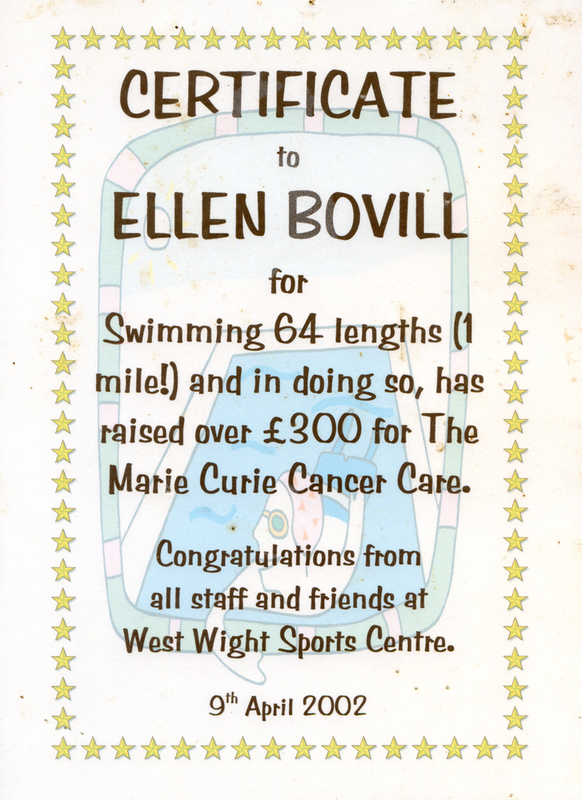 It is filed under The People and tagged with charity, Ellen Bovil, Freshwater, Island, Isle, Isle of wight, mile, Pool, Shirley Miles, Sue, Swam, Swim, swimming, swimming pool, west, West Wight Swimming Pool, Wight. You can follow any responses to this entry through the RSS 2.0 feed.